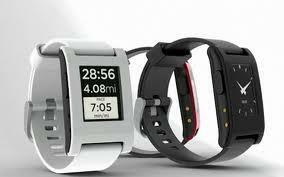 Pebble Smartwatch is one of the most fascinating gadgets that were really center of attraction during Consumer Electronic Show 2013 in Las Vegas. The 1.26 inch wrist watch is not only a timer device but also works like a small mobile phone showing messages and notifications. This is a very light weight hand watch that reminds of James bond movies giving ultimate experience of smartphone connectivity, reading out text as well as playing music. The device is getting more and more customer attention day by day and its popularity can be estimated by viewing its funding goal achievement of $100,000 in just two hours of release. With 12.6 inches screen, the watch has daylight readability as well as e-paper display giving 144 x 168 pixels of screen resolutions, allowing users to read emails and smartphone notifications. The simple backlight allows you watching time and text on watch with illuminating panel at night that gets enlightened automatically as soon as user receives any notification. Not only this, users are also provided option to scroll through notifications using side mounted buttons. With a dimension of 1.97 x 1.18 inches, the Pebble smartwatch is available in three colors, black, white and red with 22mm comfortable rubber strap. Its water proofing capacity down to 50 mtr allows you to wear it while swimming in water pool or taking bath. The device has Bluetooth 4.0 support for connectivity and strong battery backup of 168 hours. It has connectivity with Android and iOS 5 devices, Bluetooth 4.0 and also has an accelerometer too. Besides this, users are also provided options to change watch faces. Pre-installed with two iOS 5 and Android 2.3 apps, the device enables you doing initial settings very easily. The Pebble smartwatch can easily be connected to your smartphone via connecting cable. 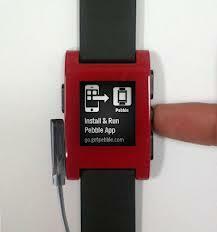 As soon as a user selects default watch face, the Pebble watch gets synchronized with your smartphone, automatically. User can download other apps from custom app store and can add more watch faces to device including TicTockToe. To dismiss any notification, a user can shake his wrist or press a side button. Out of various fonts sizes on device, user can select anyone to see his smartphone notifications and can also use up and down buttons for scrolling. The device has already been released in market on January 23 and interested customers can purchase it at the price of US $149. The device will be shipped with a proprietary magnetic USB charging cable. Small display not able to display full messages hence one requires to jump to smartphone to view complete message. Toshiba, Sony, BlackBerry as well as Allerta are some of the tough competitors of SmartWatch in market. Sony and Toshiba are technically very sound and ruling the market for very long time. Toshiba also introduced its surprising wrist watch prototype capable to pair with user’s IOS or Android phone and giving notifications just like Pebble Smartwatch. While pairing to user’s phone, Tohisba wristwatch will alert him calls, calendar notifications, emails, news as well as weather and GPS directions. But unlike ‘e-paper’ display of Pebble smartwatch, Toshiba device will come with OLED color display with ARM processor. But this is just a prototype and Tohisba has not confirmed its price and arrival time in market. And we cannot forget Sony smartwatch which has now become style icon of modern lifestyle. The Sony smartwatch is capable to work with your android smartphone and is called 'Android Watch'. A user can download device apps from Google play. You can control music player with your wrist while using this device and there are also many other fitness apps available on this Sony wrist watch. The BlackBerry models have smartphone connectivity and use OLED display. On the other hand, inPulse from Allerta is also staying in market for several years. Though large number of technology products are already available in market, Pebble from SmartWatch is one of the most innovative products customers are looking for, since long. Its connectivity with both Android as well as iOS operating systems will open ways for developers to add more user-friendly apps to the device in future. So, the device is expected to be in more demand, in near future. Being one of the successful kickstarter projects of last year, the device fetched around 85,000 unit orders to SmartWatch company. This watch does not seem to be designed targeting at a specific field customer, so, professionals from different field as well as home users can use this device. And on looking over features like e-paper display, third party apps support and connectivity with smartphone, I personally feel that its price is reasonable, which has also been proven with starting sale and pre-orders for the device.